Win a Graze Snack Box! 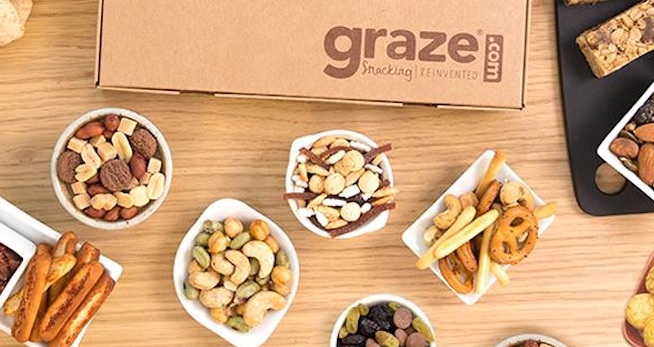 If you’re often grabbing junk food snacks, here’s your chance to win a Graze Snack Box, to get satisfying snacks that won’t compromise your diet. Graze is a snack subscription service that delivers a variety of natural, wholesome, and nutritious snacks right to you door. With 100+ different types of snacks and 4.9 million different combinations of snack selections, Graze has something for everyone! Every graze pack is perfectly portioned to keep you satisfied and feeling full. Plus, all Graze snacks are made in-house and contain no GMOs, no high fructose corn syrup, no artificial flavors or colors, and have 0 grams of trans fat per serving! 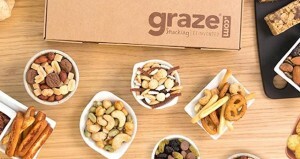 We are giving ten lucky Appetite for Health fans a chance to win a box of personalized snacks from Graze.com. Graze is a fun snack service that delivers unique, tasty, and guilt-free snacks to your door. A standard graze box contains 8 snacks and can be delivered on a weekly, or biweekly basis. Snack packs are either boxes of 4 snacks ($6.99/box) or 8 snacks ($11.99/box). The snacks come in perfectly portioned packs that are great for on the go and enjoy without overdoing indulging. Every snack has benefits. Some snacks contain fruit, whole grains, protein, vitamins and minerals, fiber, are 150 calories or under, and are specifically picked by a nutritionist. Symbols designating benefits are assigned to the qualifying snacks. A nutritionist scrutinizes every snack recipe to ensure each one has a nutritional benefit. Like Appetite for Health and Graze on Facebook. Open to US residents only. All AFH terms and conditions apply. I got these for a while and they are awesome. I would most like to get this because I think I would love to subscribe again. I am working on losing some weight I put on this year. I’d love to try graze because one of things I am working on is having healthy snacks where I need them so I don’t grab whatever! Nuts and dried fruit are my favorite snaking foods. Thanks! The snacks come in perfectly portioned packs that are great for on the go and enjoy without overdoing indulging. I have a portion control problem so this is perfect! My family of four would greatly appreciate some healthy ready to eat snacks! Graze looks like it would fit the bill. I can’t wait to open my Graze box because I love both surprises and snacking!! I can’t wait because having a healthy alternative to what I really want to eat is the key for me to be successful in loosing weight. I like that they are proportioned snacks–that will help me stay on track. This would be a fun box to open!! I like personalized delivery because it can be frustrating having special dietary needs and having to go through aisles of products rejecting them for one reason or another and then finally taking something home out of frustration only to have to reject that too upon further examination. I’m not good at portions either :O) so this sounds wonderful. I just love salty snack foods and these sound so healthy and delicious. I just know I would love them all. The wonderful variety of healthy and nutritious snacks. Knowing how healthy and delicious nuts are, it would be more than awesome to have a personalized box of goodies coming my way! What a wonderful concept for real food snack boxes, awesome job Graze people!! Because I love to see what kind of healthy snack foods come in these. Love to have healthy snacks around. I’ve heard great things about Graze and would like to try them out. It would be a perfect snack box for having at work. I’m trying to eat more healthy and these are snacks I don’t have to feel guilty about. I have read about the graze snack box & winning one would be great way to sample. I always try to eat healthy snacks, such as nuts and fruit—having a Graze snack box would be wonderful! I can’t wait to open up your box of personalized snacks from Graze because it sounds amazing and everything is so healthy! I can’t wait to open up your box of personalized snacks from Graze because it’s fun to try new snacks without a major purchase. I also like the controlled portions which allow variety and anticipation! I can’t wait to open up my box of personalized snacks from Graze because I need healthy and delicious snacks for work. Who would love to win this? Portion control is so important to me! i would love the healthy options. one of my biggest problems when it comes to food is im an evening snacker and grazer and I have trouble with portion control. Would make for a good alternative to my poor eating habits. I heard the snacks are really good and are personalized to your preferences. I would love to have some healthy snacks on hand during my holiday season during shopping trips. I hate shopping. Would love to get a healthy, tasteful snack! I definitely need to keep some healthy and easy to eat snacks at work, and I think a Graze box would be the best thing EVER to try out!!! I need to lose about 10# and their healthy snacks would be perfect for me!! These snacks would be perfect to have on hand for the busy holiday season. It will keep me from reaching for the sweets! I cannot wait to open my first Graze box to share with my friends at yoga so we can all healthfully graze together after class and get energized! I liked both on Facebook and receive your email. I’d be ecstatic to have healthy snacks to provide for my two grandchildren. They like a variety of healthful foods, but I’d like to have something other than fruit or cut-up veggies. Would love to try Graze snack packs. Always looking for something nutritious to grab for a snack so I dont “graze” through my fridge and grab something I shouldnt! Thanks. It looks like there is a great variety of delicious snacks. Thanks for the giveaway. I Like Appetite for Health and Graze on Facebook! I love the idea of perfectly portioned healthy snacks and a large variety of them to choose from a swell! The snacks would be great for my busy lifestyle as a professor/RD/educator! I’m a grazer by nature and tend to snack all day as is so these would be a healthy way to satisfy your munchies. I’m a Facebook fan too and subscriber. Thanks! The varieties are awesome – so many neat and new things to try that I wouldn’t normally go for! Because of the varieties and all the delicious foods… And of course so health for you! I have Liked Appetite for Health and Graze on Facebook. I can’t wait because the pictures look amazing and I would love to try them! I am a fan of Appetite for Health and Graze on Facebook. I think that this would be great for snacking at work. I shared on Google +. I love healthy snacks and pre-portioned ones are my favorite. I don’t feel bad after I eat the whole bag. I love healthy snacks. Thank you! I love healthy snacks and have heard good things about this company. I love the fact that healthy snacks can be delivered right to my door!! I hope it’s real good so I can get a chance for a second chance to win?